Only one species of Lapsana are recorded in Britain - Nipplewort (L. communis). It is a native species. Ten British miners are recorded on Lapsana. A key to the European miners recorded on Lapsana is provided in Bladmineerders van Europa. 1a > Stem-miner: External stem-miner (Spencer, 1972b: 61). On Sonchus oleraceus, but not yet on Lapsana, in Britain. On Crepis, Lapsana and Sonchus elsewhere. Uncommon, but locally abundant in Britain including London, Essex and Hunts. Widespread in continental Europe. Also recorded in Brazil, Canada, and the Afro-tropical, Australian, East Palaearctic and Oriental regions. Phytoliriomyza arctica (Lundbeck, 1901) [Diptera: Agromyzidae]. 1a > Stem miner: An external stem mine with frass in two rows of disconnected strips. Pupation in stem at end of mine (Spencer, 1972b: 25; Spencer, 1976: 61 (fig. 63B), 65-6)..
Polyphagous. On Campanula, Jasione, Phyteuma [Campanulaceae], Crepis, Hypochaeris and Lapsana [Asteraceae] in Britain and additional genera of both families elsewhere. Uncommon in Britain - recorded in London, Warwick and Cambridge. Uncommon but Widespread in continental Europe. Ophiomyia heringi Stary, 1930 [Diptera: Agromyzidae]. 2a > Leaf-miner: Mine primarily associated with mid-rib. 2b > Leaf-miner: Mine not primarily associated with mid-rib. 3a > Leaf-miner: A distinctive mine primarily above mid-rib, with irregular short lateral offshoots into leaf blade. Pupation external (Spencer, 1972: 51 (fig. 172), 55; Spencer, 1976: 270, 271 (fig. 486)). Polyphagous. On more than 40 host genera in 15 families, including Lapsana, in Britain. Widespread throughout Britain. Also recorded in the Republic of Ireland. Widespread in continental Europe. 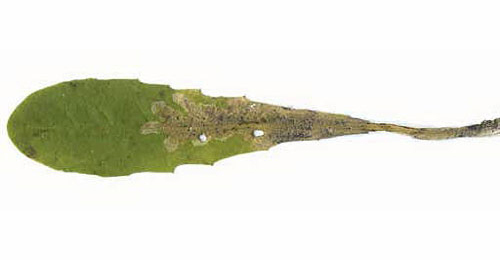 3b > Leaf-miner: A whitish blotch mine along mid-rib, with offshoots into leaf blade. Pupation takes place at the base of the mid-rib (Spencer, 1972b: 25; Spencer. 1976: 63 (fig. 66)). The mine begins as a very narrow, upper- or lower-surface corridor, somewhere in the blade. When this hits a thick vein the larva uses this to descend towards the midrib. From that moment the lave lives in the hollow midrib. From here short, lobate corridors enter the leaf blade. 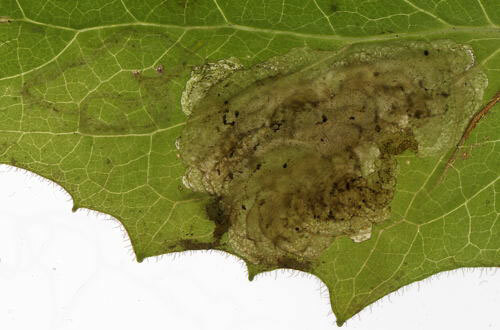 The larva may move to another leaf by way of the leaf base. The corridors in the leaf are virtually free of frass (at most a few grains where they leave the midrib); frass is concentrated in the base of the midrib. Here also the pupation takes place (Bladmineerders van Europa). On Crepis, Hypochaeris, Lapsana, Mycelis, Picris, Sonchus, Taraxacum and possibly Bellis in Britain and additional genera of Asteraceae elsewhere. Widespread in Britain and throughout much of Europe. Ophiomyia cunctata (Hendel, 1920) [Diptera: Agromyzidae]. 4a > Leaf-miner: Mine linear, whitish, both upper and lower surface. Pupation internal, at the end of the mine with the anterior spiracles projecting through the epidermis (Spencer, 1976: 433). Chromatomyia 'atricornis' has been recorded on Lapsana in Britain. 4b > Leaf-miner: A linear mine commencing with a conspicuous regular spiral and then continuing a considerable distance more or less straight (Spencer, 1976: 245). Upper-surface corridor. The first part is wound in a dense spiral that quickly turns brown. The spiral continues in a long, generally unbranched corridor that maintains almost the same width. Frass in long thick strings. When the mine is positioned near the leaf margin the spiral part may be missing; the thick frass strings then are sufficiently characteristic. Pupation outside the mine; exit slit in lower epidermis (Bladmineerders van Europa). Long upper surface gallery starting with a spiral of 6 to 8 turns (as shown). Frass in conspicuous narrow linear lines (British leafminers). On Aster, Eupatorium, Helianthus, Lapsana and Solidago [Asteraceae] and Galeopsis [Lamiaceae] in Britain and continental Europe. Widespread in England. Also recorded in the Republic of Ireland. Widespread in continental Europe and recorded in Canada. Liriomyza eupatorii (Kaltenbach, 1873) [Diptera: Agromyzidae]. 4c > Leaf-miner: Larva mining both lower and upper surface, unusually long, linear, conspicuously broad, frequently largely on the underside of the leaf. Pupation external (Spencer, 1972b: 76 (fig. 251); Spencer, 1976: 445 (fig. 780), 446). Corridor mine. The first part consists of a very long and narrow lower-surface corridor; the mine is quite shollow here, and often inconspicuous. The second part is upper-surface, uusally much shorter, and widens abruptly. Pupation outside the mine (Bladmineerders van Europa). 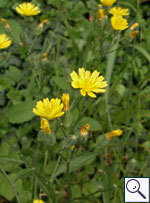 On Crepis, Hieracium, Lapsana, Picris, Pilosella, Senecio, Sonchus and Taraxacum in Britain and additionally other genera of Asteraceae elsewhere. Widespread in southern Britain, also Sutherland, Inner Hebrides and Warwick. Also recorded in the Republic of Ireland and Widespread in much of Europe. Phytomyza marginella Fallén, 1823 [Diptera: Agromyzidae]. 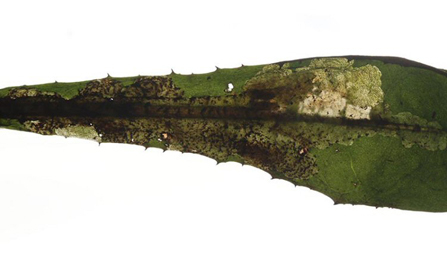 4d > Leaf-miner: The mine begins with a very narrow full depth corridor, that ends upon the midrib. Subsequently a broad corridor, or rather an elongated blotch, is made overlying the midrib; from here broad, lobe-like extensions are made into the blade. Frass in discrete grains. Secondary feeding lines conspicuous. The larva is capable of leaving the mine and restarting in a new leaf, in which case the association with the midrib may be lost. Pupation after vacation of the mine (Bladmineerders van Europa). On Cichorium, Crepis, Hieracium and Taraxacum, but not yet on Lapsana, in Britain and additionally other genera of Asteraceae elsewhere. North-east Scotland, also throughout Ireland and continental Europe, except the Mediterranean area. Trypeta immaculata (Macquart, 1835) [Diptera: Tephritidae]. 4e > Leaf-mine: Elongated upper-surface blotch, preceded by a corridor (exceptionally, visible in the picture, as a long lower-surface corridor). Primary and secondary feeding lines conspicuous. Older mines quickly turn brown. Pupation outside the mine (Bladmineerders van Europa). The mine starts as a corridor which quickly broadens into a blotch, which appears dark with white borders. It is intitially circular or slightly elongated but becomes irregular as the mine matures. 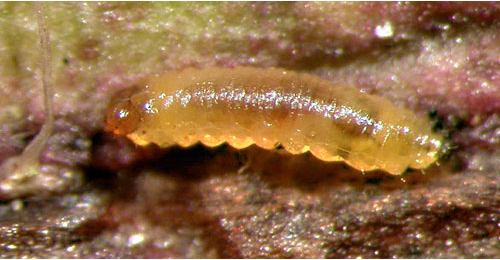 The larva is shown and feeding lines are also visible. The mine quickly turns brown and pupation is ouside the mine. The adult was bred and emerged on 10.vii.2017. 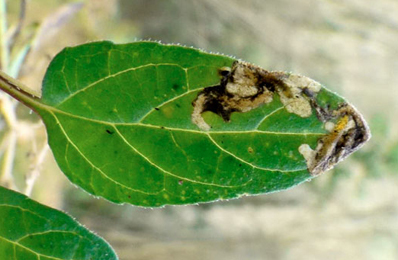 First discovered in the UK in 2010 (Godfray, 2011) (British leafminers). On Lapsana communis in Yorkshire and on Cichorium intybus, Lapsana communis, Mycelis muralis, Prenanthes purpurea elsewhere. 1a > Leaf-miner: Rather narrow corridor, untidy and sometimes branched, starting from the base of the leaf, in particular the midrib. Sides of the corridor irregularly eaten out, not really parallel. Frass mostly present, and then in a central line. The larva is capable of leaving the mine and start a new one elsewhere. These later mines are much broader, and the frass is scattered irregularly. (Bladmineerders van Europa). Host plants unknown in Britain. On numerous genera and species in several plant families, including Carduus, elsewhere. Recorded in southern England. Widespread in continental Europe. Orthochaetes insignis (Aube, 1863) [Coleoptera: Curculionidae]. 1b > Leaf-miner: The mine begins in the midrib, especially in a lower leaf, extending into the leaf disc, branching irregularly or pinnately, may also locally be blotch like. The mine is brown and very transparent. Sides very irregularly eaten out. Frass loosely dispersed or in a loose central line, buy may also be pressed against the sides of the corridor. The larva may also leave the mine and restart elsewhere (Bladmineerders van Europa). Polyphagous. On numerous genera and species in several plant families, but not yet on Lapsana, in Britain. On numerous genera and species in several plant families, including Lapsana elsewhere. Widespread in England and continental Europe. Also recorded in the Republic of Ireland. Orthochaetes setiger (Beck, 1817) [Coleoptera: Curculionidae].